The banded portion of chromosome 4 (the ”dot” chromosome) in Drosophila melanogaster displays some properties of β-heterochromatin, which is normally found within the centric domain of the chromosomes. 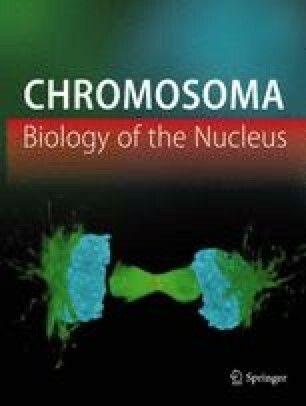 The nature and distribution of repetitive elements on chromosome 4 could play a role in the establishment of this unusual chromatin configuration. We describe here one such element: a short, interspersed repetitive sequence named DINE-1. Determination of a consensus sequence for the element reveals that there are two conserved regions (A and B) separated by a highly variable spacer. The conserved sequences are ∼400 bp long but degenerate at both ends, opening the possibility that a yet-to-be-discovered mother element may be present in the genome. DINE-1 bears few of the properties of the mammalian short interspersed elements (SINEs) to which it bears a superficial resemblance in size. It does not appear to be the product of reverse transcription and lacks any polymerase III promoter consensus. The elements are not flanked by target site duplications and their termini lack direct or inverted repeats, suggesting that they themselves are not transposable. Our analysis of cosmid clones from chromosome 4, and elsewhere in the genome, revealed that the euchromatic locations of DINE-1 are almost exclusively confined to chromosome 4. In situ hybridization of a DINE-1 probe to polytene chromosomes confirmed the preferential distribution along 4, in addition to its presence in the centric heterochromatin. This unusual genomic distribution of bias toward chromosome 4 is also seen in the sibling species, D. simulans, whose dot chromosomes exhibit poorly resolved polytene bands and lack crossing over during meiosis like those of D. melanogaster. However, the dot chromosome of D. virilis, which exhibits a well-defined banded structure on polytene chromosomes and can cross over, has only a single, discrete site of DINE-1 element hybridization. The presence of DINE-1 within these regions suggests a role in the heterochromatic nature of chromosome 4 in D. melanogaster and supports the contention that repeats accumulate in regions of diminished crossing over.